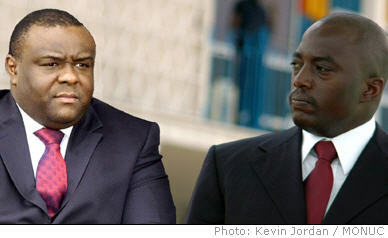 President Joseph Kabila and his rival, Vice-President Jean-Pierre Bemba, have promised that voting would be calm. KINSHASA, 24 Oct 2006 (IRIN) - As presidential rivals Joseph Kabila and Jean-Pierre Bemba prepare for an electoral run-off in the Congo on Sunday, the two international forces in charge of security during the polls, say they are ready to quell any violence that erupts. So far though, violent incidents between supporters of the two have been isolated. "The situation requires us to be prepared," Gen Karl Viereck, the German operations commander of the European Union's force in the Democratic Republic of the Congo, Eufor, said on Monday on a visit to Kinshasa, the Congolese capital. Joseph Kabila, 35, currently president of the Congo's transitional or post-war government, did not gain enough of the vote in a first round of general elections in late July, to win the presidency outright. Shortly before the results of that election were announced, fighting between his supporters and that of Bemba, his closest rival, led to the deaths of 23 people. As the second election day draws nearer, there have been reports of brawls between Kabila's and Bemba's partisans, raising fears of a repeat of the street fighting that hit Kinshasa in August. But the United Nation's force in the Congo, MONUC, and the Eufor, remain optimistic that this time around, the situation will be more serene. Viereck said Kabila and Bemba had promised him that voting would be calm. He said that in general, members of the public had behaved in a way that suggested they would largely accept the electoral result. "I am optimistic but remain a realist," he said. The UN appears to maintain the view that both Bemba and Kabila, will appeal to their supporters to remain calm. "I think that one must be confident of these statements," William Swing, Special Representative of the UN Secretary-General, said, referring to their pledges to maintain calm. "They signed undertakings, and I believe that there are no reasons to doubt the sincerity of the signatories." "Rather, we need to have confidence in the undertakings of the media," he said. "[Also] on Operation Kinshasa, [a] city without weapons, which also will be conducted in the other cities"
"We will try to eliminate pockets of violence by being vigilant for weapons in circulation," Swing stated. Viereck said the Eufor troops would support MONUC to maintain security. The Eufor is also expected to protect European, Congolese and other nationals, if law and order breaks down. Operation "Kinshasa City without Weapons" is already conducting joint street patrols in Kinshasa, carried out by EUFOR, MONUC and the Congolese army. EUFOR also has pilot-less drone surveillance aircraft flying over the city, and has stationed 200 more troops in Kinshasa, to add to 900 already deployed there. The rest of EUFOR's troops are in reserve in Gabon. Tension exists between Bemba supporters in Kinshasa and the western half of the Congo, and those from eastern Congo, a Kabila stronghold. Some 16,000 or more soldiers from various factions have still not been integrated into the Congo's new national army, making it risky for Bemba to campaign in the east, Delly Sesanga, a member of parliament for Bemba's Mouvement de liberation du Congo party, said. According to Col Aime Mbiato, in charge of army integration, some 120,000 soldiers from various factions have, however, been integrated. Kabila has also come under criticism for putting military men into the posts of mayor in Kinshasa, and to head the Interior Ministry - moves some say are necessary to ensure security. Kabila and Bemba agreed in August to restrict members of their forces not assigned to election security duty, to barracks.